Round two of #ScaryMovieMonth picks. 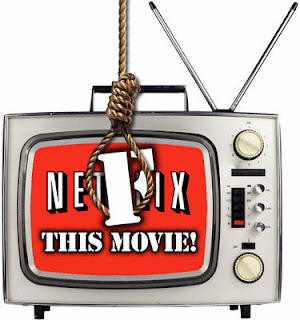 Watch them and post your seven-word reviews in the Scary Movie Challenge! Adam Riske The Serpent and the Rainbow (1988, dir. Wes Craven) This movie's a doozy. 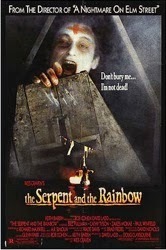 The thing I look for most in a horror movie is mood, and The Serpent and the Rainbow is one that has a constant feeling of dread, threat and danger. I felt like bad things were going to happen to me and I was just watching it on my computer! With the main subject being voodoo, it allows for the movie to go in some unsettling and weird places with really interesting imagery. Above all else, this movie is a uniform success in production value. I wish the script was a little tighter (shoehorning in a revolution in Haiti doesn't do its climax any favors), but my main takeaway from the movie is its unique take on the tired zombie subgenre. Last week, Heath wrote about horror and belief and this might fit my quota for that this month. What's scarier than someone trying to kill you? How about someone trying to taunt your soul even after death? Yeesh! Erich: Evil Dead 2: Dead by Dawn (1987 dir. 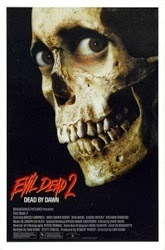 Sam Raimi) I'm embarrassed to admit that last week was the first time I'd ever seen Evil Dead 2. No idea why I waited so long, but I finally understand why everyone loves this sequel. It's funny and gloopy; the special effects are so delightfully low-fi it makes me wish for a portal into an alternate reality where CGI was never invented; it fleshes out the mythology of Raimi's take on Lovecraft's Necronomicon; and it clocks in at a tight 84 minutes. Best of all is Bruce Campbell who plays like a hunky Jim Carrey, taking physical horror comedy to a new level. You will believe a man's hand wants to murder him! And vice versa! Watching a month's worth of horror movies can take a toll on one's psyche, like crawling for a month across a burning desert of human pain and misery. Movies like Evil Dead 2 are a cool drink of water. At least, I hope that's water. Heath Holland: The Bride of Frankenstein (1935, dir. James Whale) What is there to say about this classic that hasn't already been said? I saw this movie for the first time two years ago after hearing and reading how much JB adored Universal Horror. Now I can't imagine an October without watching it at least twice during the month. This film has come to symbolize everything that I love about horror. It's dark but light, funny yet sad, subversive but beautiful. 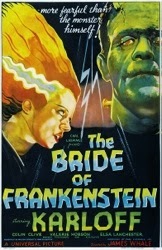 In other words, The Bride of Frankenstein is a masterpiece; it's also the rare example of a perfectly realized movie. All Universal Horror is massively influential, but I believe that this movie, more than any other, influenced and shaped what Halloween has become in the last three-quarters of a century. They simply don't get any better than this. Patrick: Vamp (1986, dir. 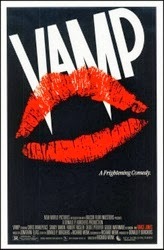 Richard Wenk) I won't argue that Vamp is one of the best vampire movies ever made. I mean, it didn't even make the list of my five favorites. But if you're a fan of '80s horror comedy, there's a lot to like. Here's a movie that attempts to explain Grace Jones' weirdness, and which gives Dedee Pfeiffer her best platform ever for being adorable on film. Plus, is it just me, or is this movie really good at creating a kind of suspense around her character? 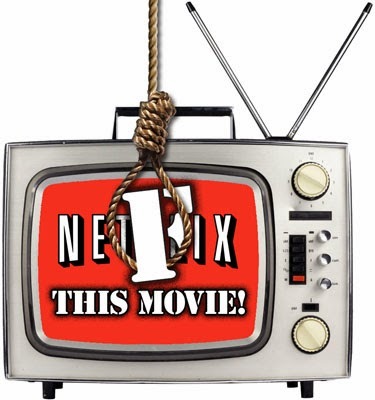 Watch it and let me know if you agree. (About to make myself unpopular around here) I still think if you take away the last jump scare in DePalma's Carrie, it's a passible movie more interested in everyone but the title character with a WTF ending. I'm interested to see what the remake does. I've always thought Piper Laurie's Mother character was the scariest thing in the film. Now Kathy, go in your little closet and pray for your forgiveness. It is true that once we reach the middle section of the film, the focus switches from Carrie to the competing forces (Allen and Travolta versus Irving, Katt, and Buckley). What I find interesting is precisely how incidental Carrie is to these plans. Both sides are not really focused on Carrie herself, but their own anger or guilt. Note that Sue Snell never once makes an effort to reach out to Carrie to make amends or get to know her better - she's more interested in playing the martyr and offering up her boyfriend as a symbolic sacrifice - completely temporary in nature, of course. I find it hard to believe that if the prom had gone off well, Sue and Carrie would then become the best of friends. One of the developments that increases the tragedy is that Tommy Ross comes to genuinely like Carrie as the prom goes on - he's no longer playing a role instigated by his girlfriend. There MAY be something on the site next week about Piper Laurie's performance in Carrie. Because I agree with you, Mr. J-Bones, it's by far the scariest thing in that movie. It REALLY gets under my skin. True story - at a low rent carnival I tried out a "House of Horrors" that wasn't very scary. The moving walk way, the air blasts, the scary mannequins were okay but... At the very end, a guy who was working the mechanics popped out of the little hole he was sitting in and startled me...and that what the movie was like to me. It didn't make the "ride" any better. The performances were good. Piper Laurie especially. But DePalma's "signatures" (the circling, the split screen etc) were intrusive in this one film. Sisters and PotP it works - not here. The script also has a strange view of life. In the book, Carrie knew instintively her life was over after this but was going to take the whole town with her if possible. In the movie, Carrie goes home like it was somewhere she could go for safety - despite everything we see previous. She takes a bath and gets in her nightgown like life will just go on once she makes amends to her Mother. Then the house starts to implode. Because Carrie's doing it? We're shown that Carrie is dead in the closet halfway through. Luckily placed sinkhole? How is this happening? Again, it's a good movie. It's not the masterpiece a lot of people say it is, IMHO.